The OFFICIAL HANDBOOK OF THE MARVEL UNIVERSE helps usher in the Defenders' return to prominence with new profiles featuring Marvel's premiere non-team! 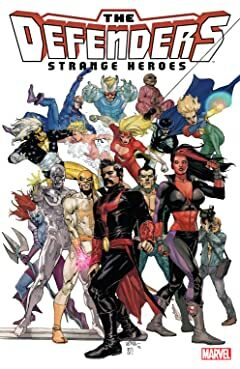 Past members (Manslaughter, Andromeda, Interloper, Cloud), foes (the Asgardian Lorelei, Mad-Dog/Baxter, Jake Fury, Sea Urchin), the unusual (Tapping Tommy, Sunshine Gross, Foolkiller/Salinger), objects of great power (Star of Capistan, Rose of Purity, Evil Eye), and one of the strangest moments in Marvel history and the man responsible for it: Defenders for a Day and Dollar Bill! 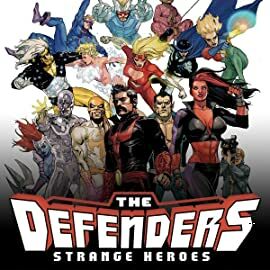 Plus: updates on the team itself and its most recent members (Doctor Strange, Iron Fist, Namor, Red She-Hulk, Silver Surfer). Featuring art for dozens of profiles by Gus Vazquez!